It is never too early to begin name recognition skill development. Although a toddler might not read, you can still work on teaching them the ability to recognize their name. These name crafts for toddlers will help in this endeavor. The crafts can also be adjusted to suit the needs of slightly older children in a preschool class. Your students will enjoy making works of art and you will have another educational tool for skill development. Learn how to create individualized name pockets, name flaps and a like-named puppet for your classroom students. Watch the fun your students experience when they play (and learn) with their crafts the whole year long! Hand out a piece of construction paper to each student. The paper should already have a simplistic shirt design on it. Hand out the two 2×2 inch pieces of paper to each student. Glue three sides of the pocket and hand the child the pocket to place on the shirt. This will require some guidance. If you have a large class you may want to have the pockets already on the shirt prior to handing them out. Have the children decorate their shirts. After they have finished, give each student two names (one being theirs). Show them how to place the names in the pockets and begin enjoying the craft. Have the students try to pick out their names, by pulling each name from a pocket separately and choosing the right one. The names can be switched around again and again. In no time you should see your students learning their names! 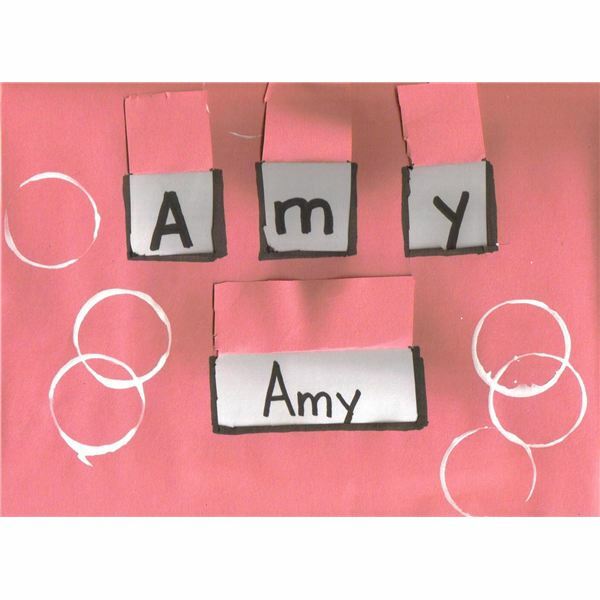 Prior to handing out the flap craft, write the child's name in separate letters for individual flaps and together under one flap (see image) on a separate, white sheet of paper. Place the colored construction paper over the name. Create flaps over the child's name in letters and as a whole. Glue the papers together making sure there is no glue under the flaps. Hand each child their name. Have them decorate the flap craft, perhaps with the theme of the week (such as circle shapes). Once decorated, this craft can be used to introduce the spelling of the child's name and full name recognition. Prior to handing out the paper bags to the students, place two eyes on the puppet along with the child's name on the "shirt" of the puppet. You can even make it look like a name tag on their shirt. Hand out the puppets to the children and ask them to color the puppet any way they wish. Once completed, their new puppet will share the same name as the child. The child and others will refer to the puppet by name. When talking to the puppet they will see their name over and over again, familiarizing the word to the student. Repetition is key to memorization and thus name recognition over time. Plus, as an added bonus, your students will now have a puppet they can call their own! Reinforce skill development by using these crafts over and over again in the classroom. If you do send them home include a note for the caregivers informing them on why they were created. Encourage them to continue name recognition at home. There is no reason to wait until children are older to teach them how to recognize their names. By using these crafts you are fostering skill development and laying the foundation for teaching a child how to read. Artwork is courtesy of the original author.